If you are looking for an affordable place to buy metal barn structures, you have come to the right place. 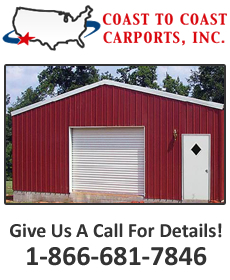 Coast to Coast Carports specializes in all things metal barn related. 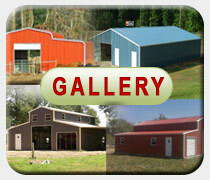 We are industry experts who can help you obtain the most suitable barn for your individual needs. 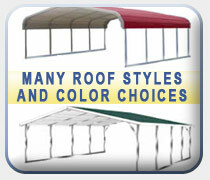 We understand the importance of having a structure that is flexible, reliable, durable, and highly functional. As a result, our selection of metal barns for sale are well-crafted and designed to provide you with years and years of dependable use. When shopping with Coast to Coast, customers can choose to buy metal barn kits or work with one of our building specialists in an effort to design and customize a more personalized metal barn. We have spent many years perfecting our building designs and we strongly believe our building selections to be some of the best in the industry. Our line of pre-engineered barn kits come in a multitude of shapes and sizes and are available with numerous optional features. Such pre-engineered buildings have been a customer favorite for years, as they are designed to meet a wide variety of needs. 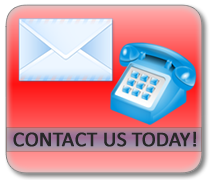 For our customers who have unique situations and require unusual or more complex building designs, we have numerous options available as well. Investing in a metal barn is a highly wise investment, yet still a big decision. That is why working with a team of professionals who are trustworthy and skilled is so important. You can count on Coast to Coast to have your back. When choosing to buy metal barn structures from a reputable company such as ours, you can be assured a pleasant buying experience and absolute satisfaction. From the moment of first contact, to selecting the right building, to delivery and setup, you can expect nothing but a hassle free experience when doing business with Coast to Coast.